This map is in every boat! Giving you the fishing hot spots for Whiting, Flathead, Gummy Shark and Snapper and Pinkie Snapper. View our fishing map in google maps and down load google earth to your iphone! It's like a free GPS!!!! Have you ever wanted to view a custom map with Google Earth on your iPhone? Well, now you can. 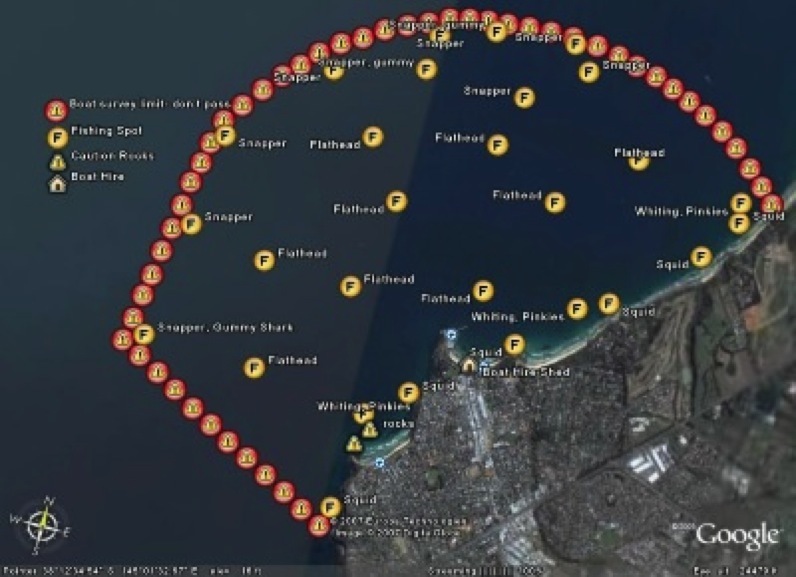 By logging in directly to your Google Maps account, you can view the same maps that you or others have created (like Mornington Boat Hire), using the My Maps interface. Maybe you're on a trip and want to see where Tony Wheeler, the co-founder of Lonely Planet, most likes to travel. Or perhaps you're fishing looking for a hotspot and you want to see where Mornington Boat Hire's resident fishing Pro Paul would fish. All you have to do is click "Save to My Maps", open Earth on the iPhone, log in with the same account information, and voilà, you have your same collection of My Maps right in your pocket.